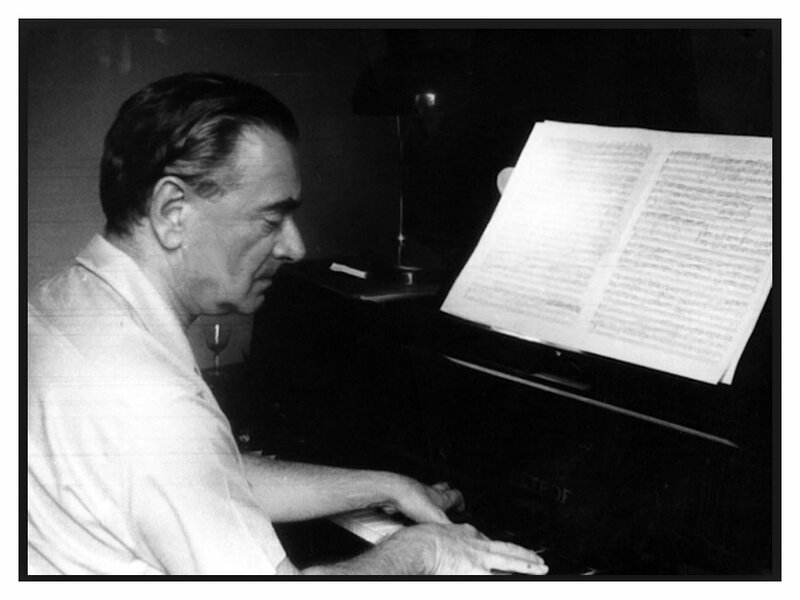 Miklos Rozsa Interview with Bruce Duffie . . . . . .
Miklós Rózsa is the composer most closely identified with noir. He was a Hungarian-born composer trained in Germany, and active in France, war-time Britain, and later in the United States, with extensive sojourns in Italy, during a career spanning more than 60 years (1931-1995). His music was at times Wagnerian, brooding and atmospheric, conveying the dark moods of noir, and at other times frenetic and electrifying, suggesting the fast pace of modern urban existence. These contrasts are clearly evident in his score for Double Indemnity. Rózsa won Academy Awards for two noir scores, Hitchcock’s Spellbound (1945), and A Double Life (1947), the story of a deranged stage actor who becomes obsessed with his role as Othello. 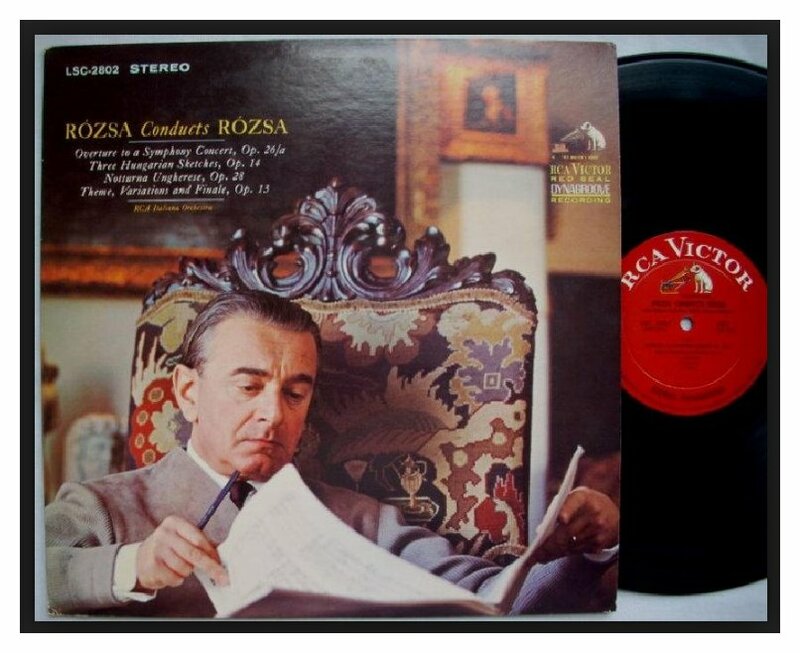 Ironically, Rózsa once described his musical career as a “double life” because, although he composed more than one hundred film scores, he maintained a steadfast allegiance to absolute concert music throughout his career. Listeners and readers of my interviews will know that my interest is mainly so-called concert music. This bias led me to the selection of guests, and most fell squarely into this amazingly rich and varied genre. Some, however, followed their talents into other areas, and from that group I was happy to make contact with a few whose work was solid in both the concert arena and film scoring. 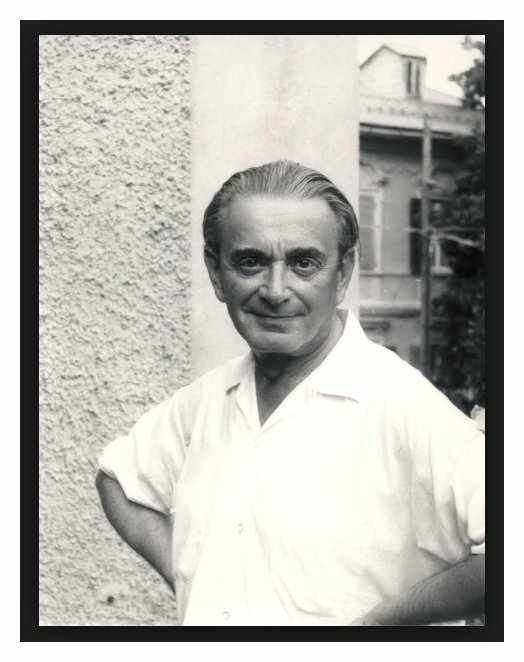 I would like to call your attention to my Interview with David Raksin, but this presentation is all about Miklós Rózsa. As noted in the brief squib above and the obituary at the bottom of this webpage, Rozsa stood firmly in both camps. Indeed, his memoir is entitled Double Life. Beginning and continuing throughout his career, he wrote concert music, but his main thrust for the biggest part of his life was film music. There are many articles and interviews with him, and, as expected, they deal mostly or completely with his movie scores. This interview is just the reverse, and deals mostly with his ideas about concert music. I had written him, and he graciously permitted me to call him on the telephone in June of 1987, just a little more than a month after his 80th birthday. Here is that conversation . . . . . . . . .
Bruce Duffie: May I speak with Miklós Rózsa please? Miklós Rózsa: I am Miklós Rózsa. BD: This is Bruce Duffie, calling from Chicago. MR: All right, thank you, and you? BD: Pretty good, pretty good. This is an acceptable time for our conversation? BD: Very good. I'd like to speak with you today about quite a number of things, and with your permission I'd like to stick mostly with your concert music. BD: You spent twenty years teaching at USC. Is musical composition is really something that can be taught, or must it be innate within each young composer? MR: Actually, the invention, which is so important in composition, cannot be taught. But the technique, yes. From 1945 to '65 I was teaching, and I had two or three hundred pupils. Some good, some not so good; but actually only one made it — Jerry Goldsmith. The rest are teaching or composing for themselves. But as I told you, to teach composition you cannot, but the rules and regulations and technique which is necessary, that you can teach. BD: Are they really rules and regulations, or are they merely suggestions? MR: I would say they were, but for our music today that doesn't exist anymore. However, I always insisted the students have a foundation. If have you have the foundation, you can go out and then do anything you want. BD: In musical composition — especially your own composition — where is the balance between inspiration and the technique? MR: I would say it's equal. I never write music if I haven't got an idea, but it has to be developed, it has to be orchestrated. This is all technical. Both are necessary. Maybe I flatter myself to think I have both. BD: I would agree that you do have both! When you're writing, are you ever surprised where the musical line takes you? MR: No, I don't think so. BD: Then you are always completely in command of the music? BD: Are you ever surprised where the inspirations come from? MR: That you don't know. It can just wake up during the night with a theme. I compose quite a lot in Italy, in the last twenty years every summer, and the beauty of the Riviera is certainly an inspiration. BD: Then when you were back home in Hollywood did you remember the beauty of the Riviera? MR: In Hollywood I mostly had to write music for films, and the inspiration came from the the theme of the scene. Somebody once wrote me and if the face of Elizabeth Taylor inspired me. I would say no, but whatever she acted and whatever she said gave an inspiration. BD: So it would be the plot of the film, rather than the actors themselves? BD: Would you write any differently if it was a different actor on the screen? MR: I don't think so. It is the scene that is what you have to express musically. I was lucky to have been connected with great films, really. How can you miss with Ben-Hur? BD: Is writing music for a film anything the same as writing incidental music for a play in a theater? BD: [A bit surprised] Exactly the same? MR: Yes, because mostly the music accompanies the actors, and instead of singing they are speaking. The musical ideas are in the music. BD: Do you feel that some of this film music works well away from the film, as a concert suite? MR: In my case it did. There was just a concert a month ago in London where the Philharmonia Orchestra gave a concert of my film music, and it was sold out. It was such a success that the Ben-Hur Suite couldn't repeated completely, because it's 25 minutes long, but the last number had to be repeated. The conductor, who was Jerry Goldsmith, had to come out six times. The Philharmonia had never played film music! BD: But they caught the style completely? BD: Were you at all disappointed in that they didn't do any of your concert music as well? MR: Yes, but they will do a concert next year of only concert music. BD: Should a concert of your music include both, or should it be just one or the other? MR: No, I would rather have it separate. I don't say film music is lower in value, but it is written for millions. It has to be direct and easily understandable, whereas concert music is written first of all for myself, and for people who like music, who go to a concert to hear music. I don't imagine for a moment that people went to see Spellbound because they like the music! They wanted to see Ingrid Bergman! BD: So then in the film you are a supporting player? MR: I would say so. BD: And in a concert you are the leading player! BD: Do you wish that your concert music was enjoyed by millions, just as your film music is? MR: No, I wouldn't say so. That's not possible. A successful film is seen by twenty, thirty, fifty million people. There are not so many people who like serious music. I am satisfied with the people who go to concert, which is naturally limited. Pinchas Zukerman is going to play my Viola Concerto here with André Previn and the Los Angeles Philharmonic four times [in January, 1988]. If it's sold out, that means three thousand people for each concert, so twelve thousand people. That is a lot. BD: What do you expect of the audience that comes to hear a concert of your music? MR: I expect them to come, naturally. I don't write the music only for myself. I write it for people. BD: Is the concert music that you write all on commission? MR: No, no, no, no. My concerti were. The first concerto was, the one I wrote for Heifetz. Then I wrote a double concerto [Sinfonia Concertante, Op. 29] for Heifetz and Piatigorsky. Then I wrote a piano concerto for Leonard Pennario, and then came a cello concerto for János Starker, and finally the viola concerto for Pinchas Zukerman. BD: I assume, though, that beyond these you have had other offers to write music. How do you decide which ones you will accept and which ones you will decline? MR: It appeals to me very much. I grew up in Hungary on the estate of my father, and listened to a lot of folk music. That was always unaccompanied, and influenced my style very much before I wrote a sonatina for clarinet, which practically every clarinet player plays [Sonatina for clarinet solo, Op. 27 (1957)]. Then I wrote the Toccata capricciosa for cello [Toccata capricciosa for cello solo, Op. 36 (1977)] which is played quite often, and now the four sonatas that I have just mentioned. BD: Are these played in concert, or are these played as technical exercises? MR: No, no, no, no! They're concert pieces. After all, the Bach Chaconne is unaccompanied too! BD: You've done quite a bit of conducting in your time, have you not? BD: Do you feel that you are the ideal interpreter of your music? MR: I don't know! But in any case, it comes out as I want it. It's quite possible that other people could do it better, but whatever I have done is exactly what I felt at that moment and what I felt when I wrote it. BD: Do other interpreters find things in your scores that you didn't know you had hidden there? MR: I don't think so. [Pauses for a moment.] No, I don't think so, because everything is orchestrated in a way that everything that is important would come out no matter who conducts it. BD: [With a gentle nudge] So you write music that can't be ruined? BD: Have you basically been pleased with the performances you've heard of your concert music over the years? MR: Oh, yes. 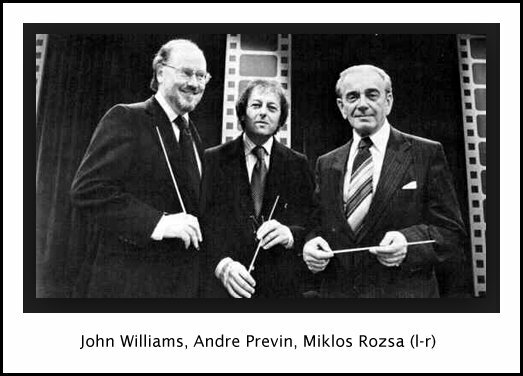 I had really great conductors to conduct my music, starting with Monteux in Paris. In Chicago I had wonderful conductors. Actually, my serious music, or concert music, was played in Chicago in 1937, before I came to America. MR: No, Hans Lange. 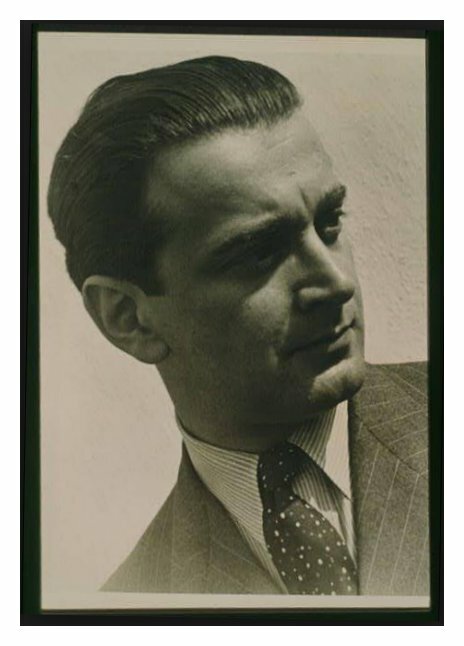 [Hans Lange (1884-1960), associate conductor of the Chicago Symphony Orchestra from 1936 to 1943, conductor of the Chicago Symphony Orchestra from 1943 to 1946] It was Theme, Variations and Finale. 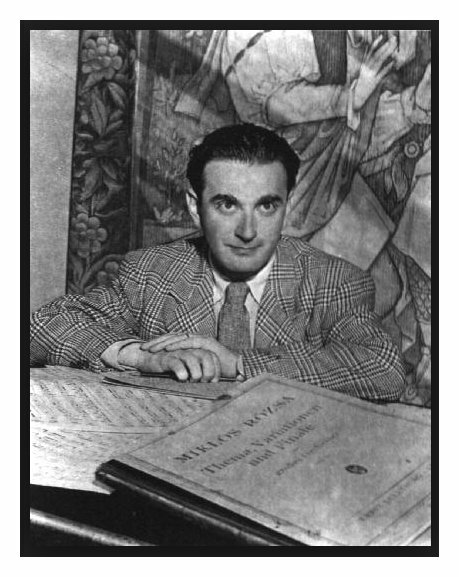 Later [in 1942] he conducted the Three Hungarian Sketches [and also the Concerto for String Orchestra in 1945]. It was actually Stock who accepted the pieces, but he asked Lange to conduct. Later my Sinfonia Concertante was given with Victor Aitay and Frank Miller. [Victor Aitay (1921-2012) served the Chicago Symphony Orchestra for fifty seasons as assistant concertmaster (1954-1965), associate concertmaster (1965-1967), concertmaster (1967-1986), and concertmaster emeritus (1986-2003); Frank Miller (1912-1986) served as principal cellist for the NBC Symphony Orchestra conducted by Toscanini (1940-1954) and the Chicago Symphony Orchestra (1959-1960 and 1961-1985)] The conductor was Martinon. A couple of years later the same soloists repeated it with Leinsdorf. [See my Interviews with Erich Leinsdorf.] Then Sir Georg Solti conducted my Cello Concerto with János Starker [November, 1971]. So Chicago is very dear to me. [In addition to his legendary international performing and recording career, Starker was principal cellist of the CSO from 1953-1958. See my Interview with János Starker, and my Interviews with Sir Georg Solti.] It's a great orchestra, and now you have a really great conductor. BD: That's a fine compliment coming from someone who understands music as well as you do. What about the performances in other places in the world — do they also please you? MR: So far, yes. I don't really go to listen to my music unless there is something important. I listen to the recordings, and they are mostly very good. BD: Do you feel that concert music works well when you're listening to it at home on a record, as well as it works in a concert hall with a live orchestra? MR: Yes. [Pauses a moment] I conducted great orchestras in America like Philadelphia, and in England the Royal Philharmonic, so I can't complain. BD: I want to ask about the Hungarian Peasant Song, Opus 4. There's a version for violin and piano, and there's a version for violin and orchestra. Is one better than the other, or are they just different? MR: No, no. Originally it was written for violin and piano, and later I made a recording and I orchestrated it. It's exactly the same, only instead of piano there is the color of the orchestra. There also another work, the North Hungarian Peasant Songs and Dances, Op. 5. That's the same. It was for violin and piano, but for the recording I orchestrated that too. BD: Do you prefer the orchestration? MR: I think so. It's more colorful. BD: In which side of your life did you feel you could do more experimentation — the concert music or the film music? MR: Naturally concert music. [Thoughtfully] Well, in the film music, I was a bit experimental in my gangster period, so to speak, such as the film noir, like Billy Wilder's films, and The Killers. But when I tried something new, the studio was very much against it because they don't like modern music. Hollywood has a certain Hollywood style, and that's what they expected. I remember, for instance, The Killers has a motive, or a theme, that you don't forget [sings] "Bum, buh-dum-bum; bum, buh-dum-bum BUM!" [This theme was borrowed without permission in 1953 for the Dragnet radio and television program.] I was told that the head of the studio didn't like the music; it was too modernistic. So I went to the musical director and I said, "Tell the head of the studio to jump into the lake. Toluca Lake is the closest." [Both laugh] After that I left the studio [Universal]. BD: When you were working in Hollywood, were you assigned to films, or were you given the option of doing the music or not? MR: I spent 14 years under contract at MGM, [1948-1962] but it was in my contract that I could choose. So I did. It was still the golden days of Hollywood, and especially MGM, and I made great films. So I chose, naturally, the best ones. BD: Were there any films from other studios that wish you had been able to get your hands on? MR: I would say yes, but when I was under contract, that was out of the question. BD: What do you feel is the future of concert music in American life? MR: I think it's getting more and more popular. There are more and more orchestras in this country, and better conductors, and the audience is getting used to more modern sound. I think it has a great future. BD: I'm glad you're optimistic about the future of music. BD: [With a gentle nudge] Did the same half of the audience leave again? BD: Oh, so they couldn't leave! MR: Right, so they couldn't leave. BD: When you're going to a concert with a new piece on it, should it be an educational thing, or should it be an artistic thing? MR: Well, it has to be an artistic thing. But it would be good — as many, many orchestras do — that there are explanations of it before. Then the public is not totally surprised. I studied at the Conservatory of Leipzig, and we had the same thing. Furtwängler was the conductor, and before the concert there was a one-hour explanation of both modern and classical music. I was the assistant of my teacher Hermann Grabner [(1886-1969)], who was a pupil of Max Reger, and I had to do it quite often. I would explain new pieces by Hindemith and so on, and by the time the students went to the concert, they were prepared. That should be done for the audience, too. BD: What do you say, then, to composers who say that the music should just speak for itself? MR: The music can speak for itself, but in form and in harmony in orchestration, there are novelties which could be explained first. Then it's much easier to understand the music. I think a composer should not speak for his music, but his music should speak for the composer. BD: Could the conductor can speak for the music beforehand. MR: [Matter-of-factly] Well, the conductor should conduct. BD: Then who should give the lecture beforehand — the composer or the conductor or someone else? MR: It depends entirely. For instance, Leonard Bernstein is a wonderful talker. I know several who talk very well and explain very well, but then I know some others who are not speakers, and they shouldn't speak. BD: Should there be a piece of new music on every concert program? MR: If possible, yes because the new music is going to be old music if people get used to it. If you give a Mozart evening or a Beethoven evening, of course no. But I don't see why not have a new piece on every program. BD: You say that the public should get used to new music... It's almost like medicine that people have to get used to taking! BD: [With mock horror] Music is like medicine??? MR: [Serenely] Why not? Medicine is sometimes very important. BD: Do you feel that the public is more accepting of new music today than twenty or thirty years ago? MR: Yes, much more, much more. BD: Are there perhaps too many young composers coming along? MR: In Chicago and in New York you see this pattern. Here in Los Angeles there are not too many young composers. BD: Is there a competition amongst composers — perhaps for performances? MR: No; I wouldn't say so. For a young composer who'd like to have his work played, that's natural. But it doesn't happen all the time. Actually, it is rather difficult to get a performance for an unknown young man. But I see that in New York and in the West, there is quite a lot of new music of young composers being played, and that is very good. BD: How are we supposed to sort out the good music from the poor music? MR: Oh, that's up to the conductor. The conductor should take enough time to examine the works which have been sent to him. Every conductor gets, I would say, up to hundred new compositions every year. Now to ask a conductor who conducts in Europe and in America to take the time to look over all these works, it's impossible. He should have maybe an assistant who looks them over. I remember one summer, Eugene Ormandy stayed here when he conducted in Hollywood Bowl. I went over to him every day, and on his piano were, oh, fifty or sixty new works. He said, "Would you help me?" and I said, "Of course." We spent about an hour or two and looked over what was good and what should be played, and what should be rejected. So it's up to the conductor to choose the good music. BD: When you're looking over scores of other composers, what do you look for to decide if it's a good piece of music or not? MR: The first thing is inspiration. Is there thematic material which is interesting, and which would interest the audience as well? Then the second is to see if the craftsmanship good. Is it well done in form, is it well orchestrated, and so on. One more important thing is to see if it has a style. This is very important. BD: Do you find that often, or not? MR: Not very often, no. Style is very important. Style you either have, or you have not. You cannot acquire it. BD: Is that what differentiates the great composers from the lesser composers? MR: In a way, yes. It is very important, for me, at least, to listen to the radio André Previn once told me that he woke up during the night and turned on the radio. He said there was a quartet, and he had no idea who wrote it. But he could swear that it was me. And it was! [Both laugh] By the way, my two quartets have been just recorded. Both quartets, and an early work of mine, Rhapsody for cello and piano. Actually it was for orchestra, but this a piano version. This is also a CD. BD: Do you like the sound that is coming from the compact discs? BD: What advice do you have for young composers? MR: To work as much as they can, and try to get a style. This comes by working. For instance, my style actually starts with Opus 3, which is the Rhapsody for cello (1929). Opus 1 is a string trio (1927, revised 1974). It is a good piece; I was twenty years old, and Opus 2 is a piano quintet from 1928. It still was trying to find a style. In Opus 3, I think I more or less found it, then in Opus 4 I already have a style. BD: Did your style develop over the years, or did it stay the same? MR: It did develop, but it's still the same. My most successful work was the Theme, Variations and Finale, that Hans Lange conducted. That was played all over the world. Bruno Walter played it in Vienna, Amsterdam, Rotterdam, The Hague, and finally in New York in 1943. That was a famous evening, because he conducted Thursday, Friday, and Saturday, and then his doctor forbade him to conduct on Sunday afternoon. So they called in a young assistant, whose name was Leonard Bernstein. 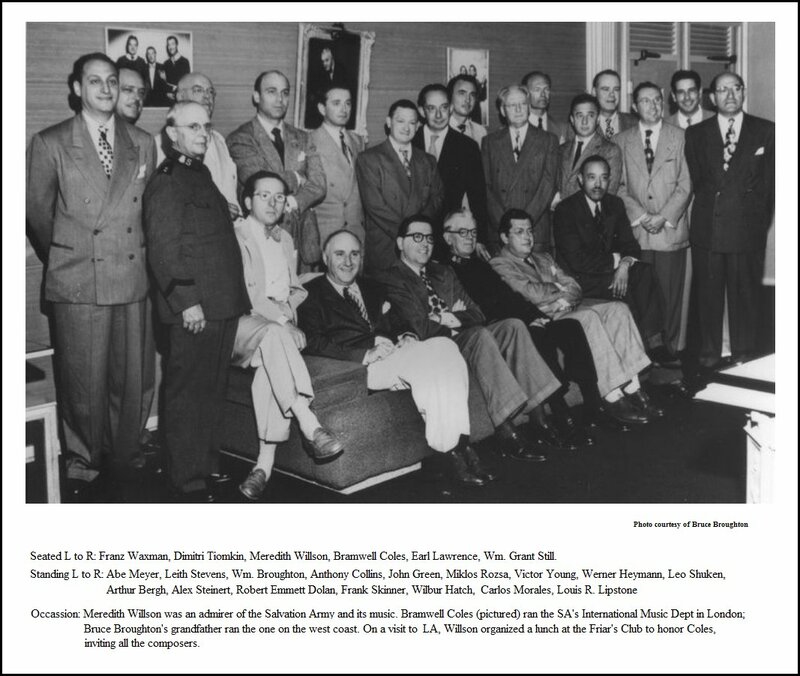 Bruno Walter was in bed, and Bernstein said, "When do I rehearse?" Walter said, "You don't. The orchestra's coming in Sunday afternoon and you just have to conduct it." I must say it was a fantastic performance. It's on record now. The New York Philharmonic put it out on my eightieth birthday, which was two months ago. Leonard Bernstein sent me a copy. It was a perfect, absolutely perfect performance. BD: I want to ask you about your autobiography, called Double Life. This refers to the films and the concerts? BD: Did doing these two things ever make you feel schizophrenic? MR: I just developed like that. 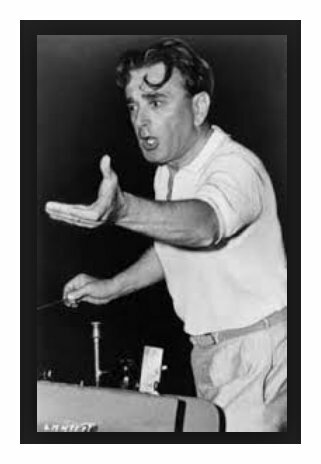 Actually, I wrote my symphonic music, I wrote film music, I was teaching, and I was conducting! BD: So it was really quadraphonic! MR: Yes, but I enjoyed it all. MR: It's the most exciting thing in the world — at least for me! To sit down and look at the music paper with empty lines, and suddenly fill it with ideas? That's very exciting. BD: When you're writing a piece of music, I assume that you go back and tamper with it a little bit? MR: You mean change it? MR: [Interjects] Oh, yes. I actually leave it for one year before I have it played or published. In the last twenty years I went to Italy. I had a little house, and I was there in June until September. That is where I wrote each piece. Then I came back and had to work for MGM, and I let the piece lie in Italy until the next summer. Then I made many changes. I would say that the eraser is more important than the pencil! BD: Amongst all the changes, then, how do you know when the piece is finished? How do you know when it's ready to go? MR: I would say that after one year you look at it completely new. When you finish it, naturally you think that's the best you can do, but a year later you see something is too long or something is not as well developed as it should be. So it's not much work. I would say two weeks is enough to get it in complete and final shape. BD: But perhaps if you had left it yet another year, would coming back to it a third time make any difference? MR: No, no. Once it's published, once it's performed, I leave it... with the exception of the Sinfonia Concertante for Heifetz and Piatigorsky. The first performance of the whole work took place in Chicago, and it was t-e-r-r-i-b-l-y long. Every critic wrote, "Forty-five minutes is for a Mahler symphony, but not for a sinfonia concertante." And they were right. We got together after the first performance with Martinon and Victor Aitay and Frank Miller, and made cuts. It's published now with the cuts, and this is the final version. BD: So then if anyone 100 years from now was to go back and try and find the original version, you would not want that? MR: [Laughing, horrified] Oh, no! I would shoot him! BD: How much does the public decide which music will get played and which will not? MR: Well, this is up to the conductor, whether he wants to play the music he likes or he wants to play the music the public likes. BD: Is the public right? MR: [Thinks for a moment] No, not always. The public can be educated. BD: You say that the conductor and also his assistant should look at scores, but now some of the orchestras have composers-in-residence. Is this a good thing? MR: Yes, it's a good thing. The difference, of course, is how good the composer is, but I am sure that the right man is taken everywhere. BD: But do you feel that it should be a composer who is deciding whether works by other composers should be done? MR: [Considers for a moment] Well, there is some danger in that because a composer will represent a certain style. Then comes another composer with an entirely different style, and I'm sure he wouldn't like it. However, I think every man with ideas should be given a chance to be heard. For me this is the main thing. Then the public will decide, ultimately, whether they like this music and want to hear it again or not. BD: So then the ultimate judge is the public? MR: The ultimate judge is the public because it is written for the public. The public listens to it, the public stays for a concert to hear music that may mean something for them. Let's take the case of Bartók. When I grew up, it was actually a dirty word in Hungary. His music was not played, and where it was played, people were whistling and shouting and so on. Today he's a classic. BD: Are some of the composers coming along today that are being whistled at and disliked classics of the future? MR: I think the public is better educated now, and behaving better. They are not whistling anymore. BD: [With a gentle nudge] Are there some scores that should be whistled at? MR: Well, I heard quite a lot of compositions where I would have liked whistling... names will not mentioned! BD: No, no, no. I would not ask you to mention names. We've been talking about composers. What advice do you have for the young conductor coming along? MR: There are a lot of young conductors coming. I must say they are very good. By young, I mean between twenty and thirty. BD: What advice do you have for them? MR: This is very difficult. To get a job as a conductor is not easy. They should become assistant conductor first. They should study very seriously and should become assistant conductors, and then they will become conductors one day. Zubin Mehta came here to Los Angeles when he was, I think, 22 or 23. He gave one concert, and immediately he was given eight concerts for the next season because he made such a great impression. BD: Earlier you spoke of advice for composers. Do those suggestions carry through to composers of film music as well as concert music? BD: With your dramatic flair, I am surprised that you never wrote an opera. MR: That's quite true, but I say that all the films were my operas. BD: I want to thank you for being a composer. MR: I couldn't help it! I was born as a composer. I was seven years old when I wrote my first work. It was a student march, and from then on I was composing instead of learning mathematics and algebra. BD: And you are still writing today? BD: Good. I hope for lots more inspiration from your pen. MR: The inspiration still comes. For instance, I have started an oboe sonata. [Sonata for oboe solo, Op. 43 (1987)] I love the instrument and love its sound, and that's the inspiration. BD: Thank you for spending the hour with me this evening. I have learned a tremendous amount, and it's a great pleasure to speak with you. MR: Thank you very much for writing me and calling me. It was a pleasure to talk to you. 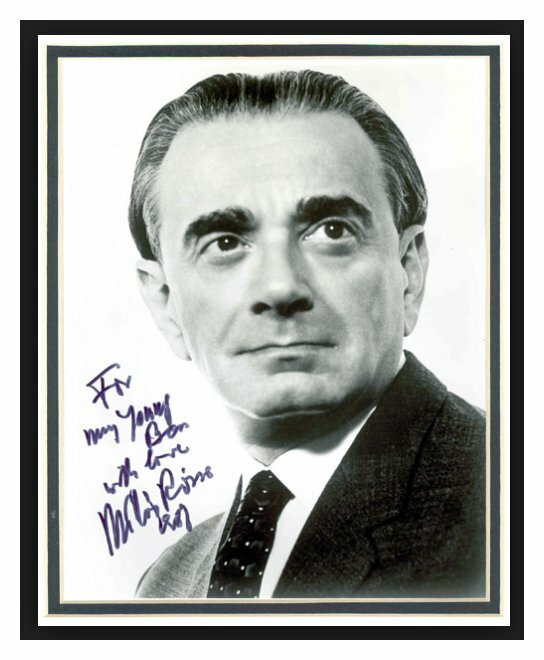 Miklos Rozsa, whose opulent scores for some of Hollywood's most lavish epics earned him three Academy Awards, died at Good Samaritan Hospital in Los Angeles on Thursday. He was 88. He had suffered a stroke about three weeks ago and been put on life support, family members told the Associated Press. Mr. Rozsa was known for doing meticulous research before composing for his films, which included "The Four Feathers" (1939), "The Thief of Baghdad" (1940), "Jungle Book" (1942), "Quo Vadis" (1951), "Ivanhoe" (1952), "Julius Caesar" (1953), "Ben-Hur" (1959) and "El Cid" (1961). The re-creation of ancient music was his most difficult challenge, since only the most fragmentary suggestions remained of what the ancients listened to. So for "Quo Vadis" he had nonfunctioning copies of ancient Roman instruments made, then tried to imagine how they might have sounded. And for "Ben Hur," he went to Rome and stood on Palatine Hill, trying to imagine what had happened on the Via Sacra 2,000 years earlier. "I began to whistle scraps of ideas and to march about excitedly and rhythmically," he recalled years later. "Two young girls looked at me in terror and fled, muttering 'pazzo' " -- which means "madman" -- but of my lunacy was born 'Parade of the Charioteers,' which is now played at football matches and university festivities all over America." Mr. Rozsa was so prolific that he frequently competed against himself for honors. In 1945, for example, he won his first Oscar for the score for "Spellbound," but would have preferred winning the award for his music for "The Lost Weekend," nominated at the same time. Mr. Rozsa said he felt "The Lost Weekend" had "the stronger score." Both scores used large studio orchestras and featured the theremin, an early electronic instrument that wailed like a cross between a neurotic contralto and a frightened viola. He was awarded his second Oscar for "A Double Life" (1947) and his third for the music for "Ben-Hur" (1959). 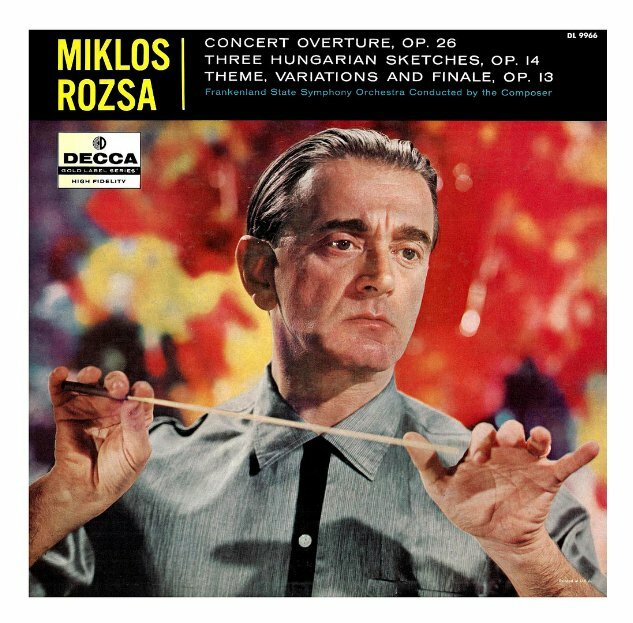 Although best known for his movie music, Mr. Rozsa also composed many works for the concert hall, including tone poems, rhapsodies, variations and concertos, many of them reflecting his interest in the folk music of his native Hungary. His Concerto for Violin was given its premiere in 1956 by Jascha Heifetz. His Sinfonia Concertante for violin, cello and chamber orchestra was written in 1966 for the cellist Gregor Piatigorsky. Mr. Rozsa was born in Budapest on April 18, 1907. His father was a successful land-owning industrialist who ran unsuccessfully for Parliament. His mother, born in Budapest, aspired to be a concert pianist and studied at the Budapest Academy before her marriage. Young Miklos started composing music and playing the violin when he was 5 years old. Although he showed considerable talent, his father strongly suggested that he study chemistry at the University of Budapest. The son dutifully complied, but he studied at the Music Conservatory at the same time. Later, after his father relented, he went to Leipzig, Germany, and studied composition and violin. In 1931 he went to Paris, where he wrote some chamber music that won the approval of the composer Arthur Honegger. In the late 1930's Mr. Rozsa was introduced to Alexander Korda, a fellow Hungarian who had established London Films with his brothers, Vincent and Zoltan, and was achieving considerable success. Alexander Korda commissioned Mr. Rozsa, who had seen few movies and hadn't the slightest idea how to write a score, to create the music for "Knight Without Armor," a 1937 film starring Marlene Dietrich and Robert Donat. At about the same time, Akos Tolnay, a script writer who was also Hungarian, asked Mr. Rozsa to score another movie, "Thunder in the City." He scoured bookshops on Charing Cross Road for works on film music and managed to write the two scores. After that, commissions came quickly. In the years that followed he produced scores for such well-received films as "Five Graves to Cairo," "Sahara" and "So Proudly We Hail" (all 1943); "Double Indemnity" (1944); "A Song to Remember" and "Blood on the Sun" (both 1945); "The Killers" and "The Strange Love of Martha Ivers" (both 1946); "The Red House" and "Brute Force" (both 1947), and "The Naked City" and "Criss Cross" (both 1948). Among the other films for which he created scores were "The Asphalt Jungle" (1950), "Something of Value" (1957), "The V.I.P. 's" (1963), "The Green Berets" (1968), "Time After Time" (1979), and "Eye of the Needle" (1981). 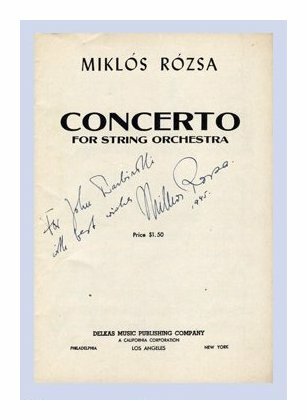 Mr. Rozsa married the former Margaret Finlason in 1943 and dedicated his Concerto for Strings to her. She survives him, as do a daughter, Juliet Rozsa-Brown of West Los Angeles; a son, Nicolas, of San Francisco; a sister, Edith Jankay of Redlands, Calif., and three granddaughters. This conversation was recorded on the telephone on June 27, 1987. Portions were broadcast on WNIB in 1989, 1992 and 1997. 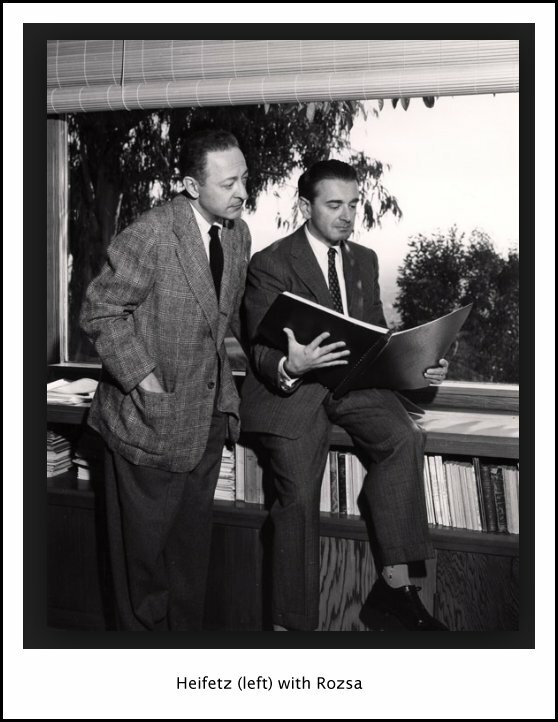 A copy of the unedited audio was placed in the Archive of Contemporary Music at Northwestern University, and also in the Rozsa Archives. This transcription was made in 2014, and posted on this website at that time.